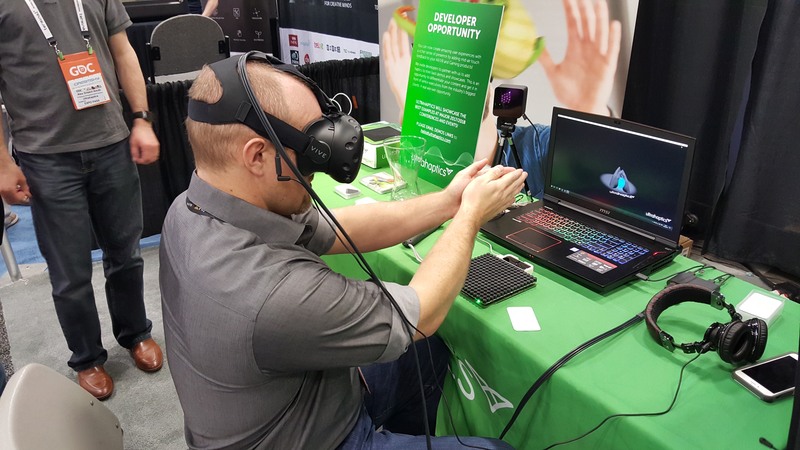 At the beginning of March, Jonathan Kling and I went to the Game Developers Conference in San Francisco to support Synapse’s clients in the VR space. Jonathan is the Account Director for our VR clients, I've managed two of our client’s VR projects, and both of us have backgrounds in mechanical engineering. As tech lovers, we jumped at the opportunity to take a peek at the latest advances in the gaming world.There were plenty of large companies present showing off their established platforms, but the more interesting things for us were the smaller booths and startups that are still working to develop their first market-ready product. Synapse’s focus and passion is taking things from concept to production, so talking with others who are in the thick of it is always a treat. Significant floor space was occupied by software companies showing off rendering engines, game engines, and international translation services. Again, we were more interested in the startups with hardware products, so we largely stayed away from the pure software offerings. We arrived first thing on Wednesday morning, when the expo floor was just opening. Everyone was pretty exhausted from the long night before preparing for the expo, and we joked with Shawn Reese of Bend Labs about the need for a tracked coffee cup for use in VR, as you want to be able to drink your real coffee while working in your virtual office. Amusingly, just around the corner, still within range of Bend’s base stations, we saw just that. It wasn’t much more than a 3D printed cup with photodiodes hot glued on, but one thing was for sure, if the cups were sold with coffee in them, they would have sold out immediately! There's a need for a tracked coffee cup for use in VR, as you want to be able to drink your real coffee while working in your virtual office. Shawn and his team were showing off the latest generation of their flexible sensor technology, which they’ve integrated into a glove that provides high fidelity hand presence in VR. The glove works in conjunction with a small form factor tracked object that straps to your wrist. The glove gives fine detail of the articulation in your fingers, and the tracked object gives global position. Together they were achieving the best natural motion hand input controller we’ve seen on the market. We stopped by the UltraHaptics booth to demo their prototype of an ultrasound-based tactile feedback system. No cables, no tracked object, just your hands in open air feeling an object in virtual reality. Safety quickly jumped to mind, considering that ultrasound can have severe effects at the right frequency and power level. I’d hate to be the engineer responsible for certification on that product! Although the demo was still in the infancy of development, the technology appeared fairly mature, and a no-touch feedback system is conceptually leaps ahead of other haptic feedback methods. Two booths jumped out due to their obviously winning user experiences. The shrieks and smiles coming from the roller coaster at Nexperience and bicycle race at VIRZoom were unmistakably genuine. 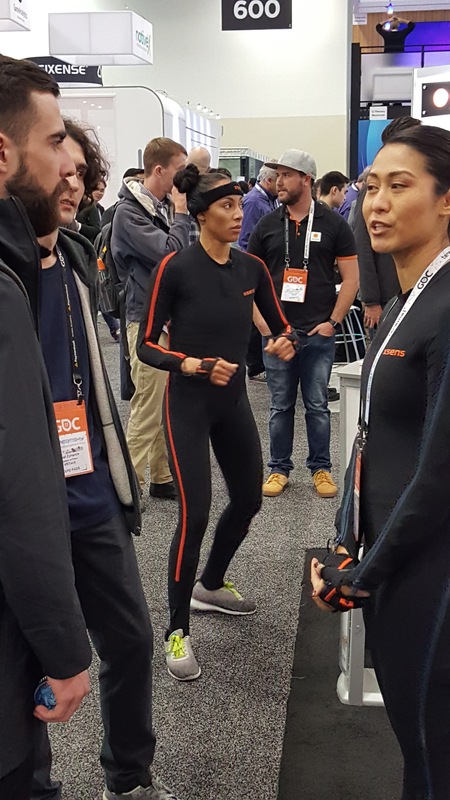 At first look, the VIRZoom booth made us chuckle; people were wearing HMDs (head mounted displays) and pedaling so furiously on stationary bikes that they were nearly toppling over. Given the level of excitement, they must be doing something right! The exercise aspect of this was particularly exciting, as a way to make VR more physically engaging as compared to traditional gaming systems. At a surprising number of booths dancers contorted in cumbersome body suits as their wildly dressed avatars followed every move on screen. Some of the dances were choreographed, some freeform, but all of the suits were too small for me (and I’m fairly normal sized, I swear). This wasn’t a big deal, as I didn’t have any particular desire to wear them, the suits looked uncomfortable and awkward. This clumsy user experience strikes me as a major stumbling block to widespread adoption of this type of body worn input device (tracked shirts/pants/suits). Suit-based tracking technology has been around for quite a while, for context: Lord of the Rings used one variety to do motion capture for the Gollum character nearly 20 years ago. The suits at GDC weren’t much less comical in appearance than those (you can google image it). I think that untethered tracking technologies will ultimately win out, they offer a more seamless and less awkward user experience and integration. Many of the new HMDs being showed off focused on pure resolution, with more than one advertising 8k resolution, which really meant 4k per eye. In order to accomplish this, and to achieve a larger field of view, the physical size of the HMDs has grown laughably large. In trying the ‘8k’ HMD from Pimax VR, this increase in size was definitely matched by an impressive increase in perceived image quality. With this much data to transmit, there are some significant challenges to maintaining an acceptable amount of latency. This challenge is most apparent when you move your head quickly. The potential for more physically active game play was a major win in my eyes, and the more we can do to untether the experience, the more enjoyable it will be. Our trip was short and exciting, with lots of new tech to see. 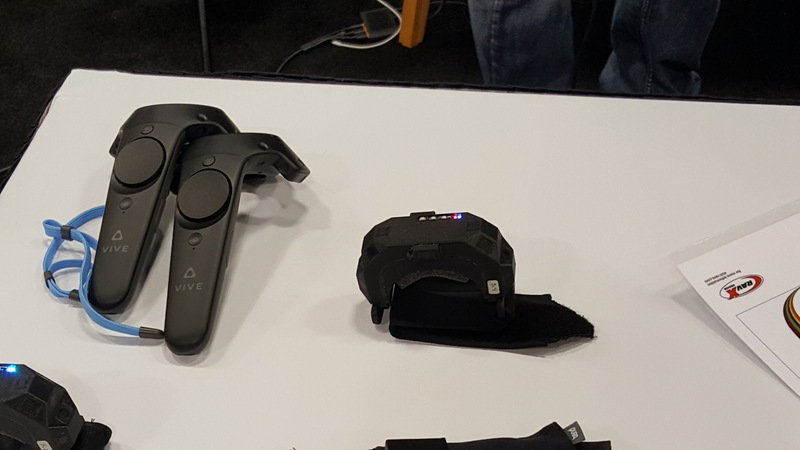 The two areas that were most abuzz with development, at least from my biased perspective in the integrated hardware space, were alternate controller styles and resolution increases for the HMDs. The potential for more physically active game play was a major win in my eyes, and the more we can do to untether the experience, the more enjoyable it will be. Here’s looking forward to the next great developments in gaming and VR!